2) Food & Stay Not Included. 3) Average Per Day 300 k/m. One amongst the foremost in style and revered gods within the Hindu.The Ashtavinayakas (Eight Ganeshas) tempels hold an special importance for the honest. The temple here is thought because the shree Mayureshwar Ganesha Mandir . placed on the banks of the watercourse Karha within the Baramati taluka of Pune district, this spot has several legends related to it. As per Hindu mythology, a devil familer as Sindhu was assassinate by Lord Ganesha at Morgaon. there's a powerful belief within the minds of the trustworthy that the ashtavinayaka journey remains incomplete while not a visit to Morgaon . Morgaon is one amongst the 3 necessary places of Ganesha and also the only 1 on this earth. the opposite 2 area unit at Kailasa . Ganesha was born to the divine couple Shiva and Anapurna in Treta Yug. the aim of his birth was to kill the demon Sindhu, the child of Chakrapani, the emperor of Mithila, and his woman Ugra. Ugra abandoned it within the ocean wherever a son was born from that craniate. The ocean came it to Chakrapani, UN agency named him Sindhu. which is however he got the facility to terrorize the folks of all 3 worlds. On attractiveness from the helpless folks to save lots of them from Sindhu, Ganesha cut him into items and removed the vessel of amrit from his soul. Morever, since Ganesha rode on a peacock and he was given a name as Mayuresha or Moreshwar. However, it's same that Morgaon had the patronage of the Peshwas, the directors of the Indian Empire. it's additionally noted for its organization with Moraya Gosavi, the saint of the Ganapatya sect. the doorway of the temple faces north. it's lacated on atiny bottom mound and thence one has got to climb eleven steps to. The picture of Ganesha has four bhuja carrying ‘pasha’ and ‘ankush’ in 2 hands. One hand rests on his knee and also the different carries a ‘modak’. The temple stands on a hummock, enclosed by thick foliage of Babul trees and is found or so one klick from the core Siddhatek village.To appease the spiritual being, devotees typically perform pradakshina (Circumambulation) of the hummock seven times, although the there's no sealed road and also the path passesf through thorny shrubs. Ballaleshwar is that the solely incarnation of Ganesha that's legendary by his follower name. it's set within the small town of Pali that is at a distance of thirty kilometer from Karjat within the Raigad district. it's settled between the initial picket temple was restored in 1760 to create means for a replacement stone temple designed by Shri Fadnis. inbuilt the form of the letter Shri, it was created by combining lead with the cement throughout construction. The east-facing temple was rigorously positioned therefore that, as the sun rises, sun rays fall directly on the murti throughout prayer. The Mandir accommodated a bell that was brought by Chimaji Appa after his failure from the Portuguese in Vasai . The murti of Vinayaka sits on a stone chair, facing to east with its trunk turned left and sitting against a background of silver that displays Riddhi and Siddhi flying chamaras. The murti's eyes and navel contain diamonds. Varadvinayak, conjointly wheat as Varadavinayaka, is one in every of the Ashtavinayak temples of the deity Hindu deity. it's set in Madh village located in Khalapur taluka close to Karjat and Khopoli of Raigad District, geographic area, India. The temple was designed (restored) by Peshwa General Ramji Mahadev Biwalkar in 1725AD. The idol of this temple Varada Vinayak c a swayambu (self originated) was found within the contiguous lake in an immersed position in 1690 AD. The temple premises area unit on one facet of a pretty pool. The idol of this temple has been faces to the east and has his trunk turned to the left. This temple conjointly has the idol of Mushika, Navagraha Devtas and Shivalinga. There area unit four elephant idols guarding the four sides of the temple. during this Ashta Vinayak Temple devotees will enter the Garbagriha and pay their deference and respects to the idol in person. Devotees visit the Varadvinayak shrine throughout the year. throughout festivals just like the Magh Chaturthi Brobdingnagian crowds may be seen during this temple. The Chintamani Temple of Theur a Hindu temple dedicated to Ganapati, the elephant-headed god of knowledge. settled twenty five kilometer (16 mi) from Pune, the mandir is "one of the gratest and supplementary legendary " of the Ashtavinayaka, the eight revered shrines of Ganapati within the Indian state of geographic area. The temple mental object describes however Ganapati retrieved the wish-giving jewel Chintamani for his follower, the sage Kapila from the greedy king Gana and the way he pacifies the uneasy mind of the god Brahma. The Mandir is linked to the ganesh saint Morya Gosavi (dated between thirteenth to seventeenth century). tho' the mandir is trust to own survive since antiquity, this structure of the temple was engineered by him or his descendant. The Chintamani Temple was conjointly a religious magnet for the Peshwa rulers, particularly Madhavrao I (1745–1772) restored and created additions to the tem tho' Theur is believed to a Ganapatya (sect that considers Ganapati because the Supreme Being) journeying centre since earlier period . The Vigneshwara Temple or Vighnahar Ganesha Temple of Ozar (also wheat as Ojhar or Ojzar) a Hindu temple dedicated to Ganesh, the elephant-headed god of information. The temple is one in every of the Ashtavinayaka, the eight revered shrines of Ganesh and Maharashtra, India. (Appa, brother and military commander of the Peshwa Baji Rao I, restored the temple and lined the shikhara (temple spire) with gold once grab the Vasai Fort sepearting the Portuguese. The temple was conjointly restored in 1967 by the Ganapati lover Appa Shastri Joshi. [ Ozar is found regarding eighty five klick from Pune off the Pune-Nashik main road and regarding nine klick north to Narayangaon. on the another Ashtavinayak temple of Lenyadri, Ozar is found within the Junnar taluka of Pune district. Ozar is settled on the banks of Kukadi stream near the Yedagaon dam engineered thereon. Ganapatidefeating Vignasura, the demon of obstacles. Lenyadri represents a series of concerning thirty rock-cut Buddhist caves, settled near Junnar in Pune district in theIndian state of region. Cave seven , known Hindu temple dedicated to the god Ganesha. it's one in all the Ashtavinayak shrines, a set of the eight outstandingGanesa shrines in Western region. Twenty-six of the caves unit of measurement one by one numbered. The caves face to the south and sq. Measure numbered serially from east to west.Caves vi and fourteen unit of measurement chaitya-grihas (chapels),whereas the rest unit of measurement viharas (dwellings for monks). The latter unit of measurement at intervals the sort of dwellings home and cells. There are also various stone-cut water cisterns; a pair of them have message. The layout of the caves, in general, unit of measurement similar in pattern and type. they usually have one or a pair of sides with a pair of long benches for occupants' use. The caves originate between the primary and third century AD; the Ganesha shrine set in Cave seven is dated to the primary century[one of hundred years] AD,though the time of adaptation to a Hindu idol is mysterious . All of the caves arise from Theravada Buddhism. Ashtavinayak, celebrating eight instances of legends related to Hindu deity. This Temple Ganpati Idol was inaugurate and given by "Khollam " Family one in all the Gold Smith Family in Ranjangaon. in step with the history the temple was in-built between ninth and tenth century. Madhavrao Peshwa created an area at intervals the basement of the temple to remain the idol of the lord Ganesa. presently Sardar chilblain of Indore restored it. Nagarkhana is found on prime of the entranceway gate. Main temple appears like temple from Peshwa's . Temple facing east has Brobdingnagian & beautiful entrance gate. One of the most popular deities in Maharashtra is Khandoba and Jejuri is the best known town of pilgrimage for his devotees. What also makes a trip to this temple worth it is that it is situated on a hillock and offers a fascinating view of the surrounding rural landscape. 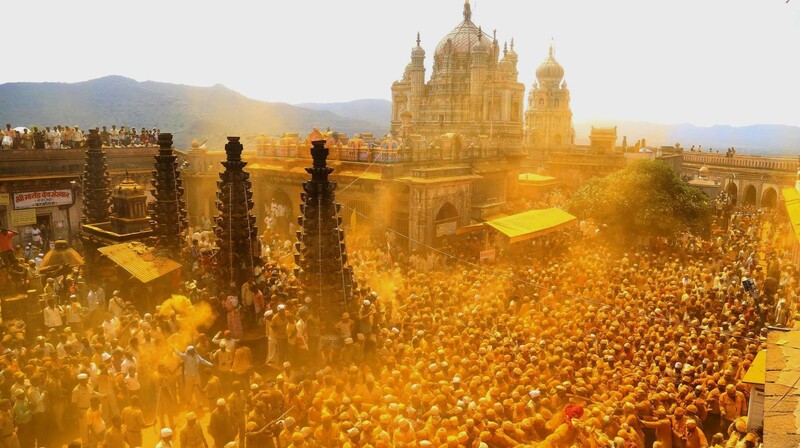 Jejuri is situated on a 758-meter high hillock about 80 kilometers away from Pune in Purandar taluka. The temple here is a huge complex with the shrines of various deities, including of course that of Khandoba. The hilltop on which the temple stands is called Jejurigad and its history can be dated back to 1688 when it was included in the fiefdom of Manaji Shankar Nilkantharao along with Shikali, Chamili and Narayanapur. It was the Maratha ruler, Shahu Maharaj, who being an ardent devotee of Khandoba, had asked Bajirao Peshwa to construct a huge tank (37 acres) at Jejuri for the benefit of the devotees. 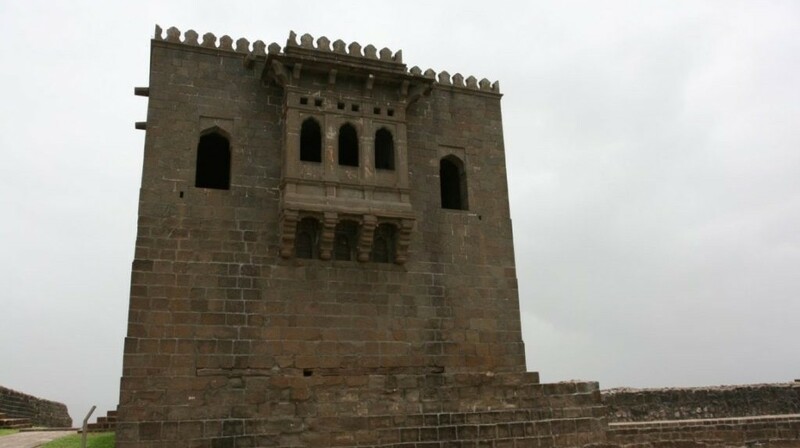 Shivneri is the birthplace of the great king of Maratha empire – The Chhatrapati Shivaji Maharaj Bhosale. Shivaji Maharaj was born on this fort in 1630 AD. This is the place where Shivaji Maharaj spent his most of the childhood. At this fort, he learned the qualities of great king and tactics required to build the empire. He was greatly influenced by the teachings of his mother-Jijabai. Shivneri has become a sacred place by the presence of Shivaji Maharaj. The fort is located at 3 kms from Junnar. 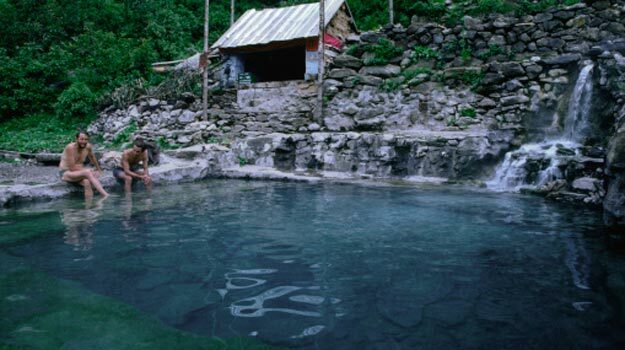 The Unhere hot water springs located in the near Pali taluka Shudhagad of Raigad District in Maharashtra State, India. Just 1 km before the Pali Ganesh temple is a hot water spring. It is at the village of Unhere and also seems to be called 'Uddhar'. The Unhere springs contaings chlorine & saline water & gives out plenty of Carbon dioxide & traces of Hydrogen Sulphide. The water temperature is between 40 to 60 degree Celsius. The water is known to possess medicinal value in curing skin diseases, allergies and rheumatic complaints Found this interesting tree in the vicinity of the Kund.